I’m a big, big John Scalzi fan. I started reading his blog and his books in early 2010. I haven’t read all his books yet, but I’m getting there. 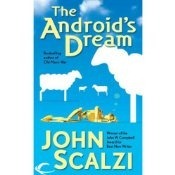 My latest read from his collection is The Android’s Dream. The murder of an alien diplomat puts Earth on the verge of war and likely eradication, and it is up to one man to find the key to preventing an untimely end to the human race. This is 100% science fiction. With a dozen alien species discussed, gigantic space ships and a futuristic earth, it can’t be classified as anything else. If you don’t like science fiction, you won’t like this one. But if you do like science fiction, you probably will like this one. I say probably, with just a little hesitation. If you are a dedicated Scalzi fan, you will like it. It’s pretty typical Scalzi, with his usual brand of acerbic wit, deep characters with multiple layers of motivations, and a complex plot. There are political undertones in here as well – or at least what might be classified as social commentary. I’d be lying if I said I understood or picked up all of them. My hesitation comes as a recommendation for people who have never read Scalzi before, either his books or his blog. If you haven’t read (and liked) Old Man’s War, then start there. And read Agent to the Stars first as well. This is a harder book to read, and if you don’t know there will be a reward at the end, you may get a little frustrated. It’s a complicated book, with a lot of characters and a very intricate plot. There’s a lot of things in motion, and at times I felt a little dizzy reading it. Overall, I liked this book, though not as much as the rest of Scalzi’s work. The complexity of the story works against the excellent characters, and there are some tangents in the backstory that seem a little unnecessary. I skimmed through some of those. But the plot is indeed unique and confirms that Scalzi is definitely one of the best writers out there.